Welcome to another Three Clover Thursday Challenge - this weeks challenge is It's a Zoo....What does that mean? Create a card or project with Animals. 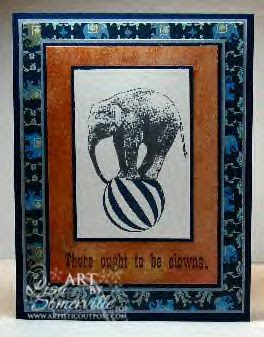 I've used the Pachyderm from the Artistic Outpost Send in the Clowns Plate. Isn't he cute? We could all use a little balance in our lives, right? Pretty CAS card today, so I won't be posting any details. Enjoy! Be sure to click on the Three Clovers Logo on my side bar to see what Kerry and the other members of the Challenge Team created. Don't forget to stop by tomorrow - this weeks Bloggers Challenge is Alter It - and I know the BC players are just gonna knock your socks off with their altered items. Lisa, this card is gorgeous! I love the whole feel of it! Great colors and that stamp is awesome! Great card. Love the image and colors you chose. Oohhh aren't you fancy...I stamp "elephants"...you stamp "pachyderms"! LOL! Sometimes I think there should be clowns running around my house! LOL! This is a fantastic card!! Great image!! Beautifully made! I love this card. I love that you use images that "aren't" me. your work is always gorgeous! This is a great stamp...have never seen it before...Reminds me of Packy from the Portland Zoo!